This article explores the rediscovery of “Confucianism” in mainland China in the field of education, understood in the broad sense of training dispensed to others and self-cultivation. It begins by examining the general context of the phenomenon and then analyzes how it is currently taking form and becoming institutionalized. On such a basis, it becomes possible to better understand one of its main features its paradoxical anti-intellectualism. Out of the thousands of temples that still existed in Beijing before the 1950s, less than a dozen are nowadays active, the remaining ones having been either abandoned or destroyed. However, the commemorative inscriptions that were carved on stelae for centuries and that still remain on rubbings enable us to understand whole sections of the history of temples and of the religious life of the capital. 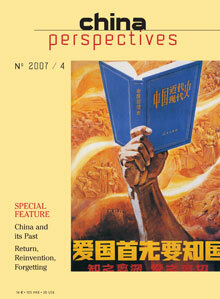 Since the Communist Party of China published its brief official version of the Cultural Revolution in 1981, few works on the history of that period have been approved for publication, even if they have kept strictly to the orthodox line. Still, some research work and eye-witness accounts by Chinese people outside the official apparatus have appeared, mostly in Hong Kong and Taiwan but also on the mainland. In spite of official attempts to bury the memory of that time, and against the grain of unreliable nostalgic recollections of some of their contemporaries, some former Red Guards and educated youth have managed, against all the odds, to put together an authentic and critically aware “people’s” memory. These scattered islands of memory of China’s “lost generation”? are under constant threat of submersion, but they are worth our attention, not only because they are essential for the future of China but also because the Cultural Revolution was an event of global significance. This paper argues that acknowledging individual victims had been a crucial problem in writing the history of the Cultural Revolution and represents the major division between the official history and the parallel history. The author discusses the victims in the history of the Cultural Revolution from factual, interpretational and methodological aspects. The first novella in Wang Xiaobo’s Trilogy of the Ages has in recent years become a genuine cult-work, in particular among Chinese students. The popularity of a text that links the sending-down of “educated youths” to the country with a golden age of sexual liberation in nature can certainly be explained in part by its scandalous aspects. However, it also conceals a sharply ironic discourse directed against the agrarian utopia of Maoism, which is associated with a regression to animal existence. From this perspective, Wang Xiaobo appears as an advocate of critical reflection, encouraging intellectuals to renounce political utopias and engage with society. His often polemical tone, when he refuses to regard past suffering as sacred, has in this way opened a precious space for discussion of the Cultural Revolution, a space that has so far proved elusive outside the area of fiction. This paper suggests how control over transmission of memory by the Party, applying China’s own dynastic tradition of reinterpreting history, and borrowing the Soviet practice of erasing people and events from records, has hindered the structuring of an opposition movement. Every resistance movement since 1949 has had to start from scratch as their actors, isolated from the past, see themselves as innovators. The paper analyses the 1957 Anti-Rightist Movement and the 1989 pro-democracy demonstrations to illustrate the thesis. This essay describes two forms of institutional redress for historic wrongs in contemporary China, arguing that one is authoritarian, the other liberal, and that neither is entirely satisfactory. Some victims of political persecution reject the right of the state to classify citizens as enemies, and with it the authoritarian method of corrective official reappraisal. Liberal avenues of redress through adjudication, on the other hand, remain closed to most victims of historic injustice, and are meaningful only if accompanied by the liberation of memory and opinion.